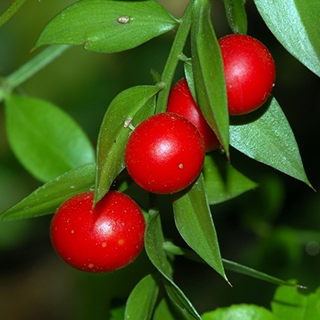 An unusual-looking native European plant with stiff spiky "leaves," butcher’s broom has been investigated in detail as a remedy for problems affecting the veins. A decoction of the root is the usual form of administration, and it is still considered of use in jaundice and gravel. One pint (500 ml) of boiling water to 1 oz. of the twigs, or 1/2 oz. (28-14 g) of the bruised fresh root has also been recommended as an infusion, which may be taken as tea. Propagation is generally effected by division of the roots in autumn. The shrub may also be propagated by seed, but quicker results are obtained by the other method. When planted under trees it soon spreads into large clumps. The root or rhizome, collected in autumn. The root is thick, striking deep into the ground.